We returned home on Thursday night from a ten-day quadding adventure that would make most children quiver with glee. It sure gave my kids plenty of thrills. 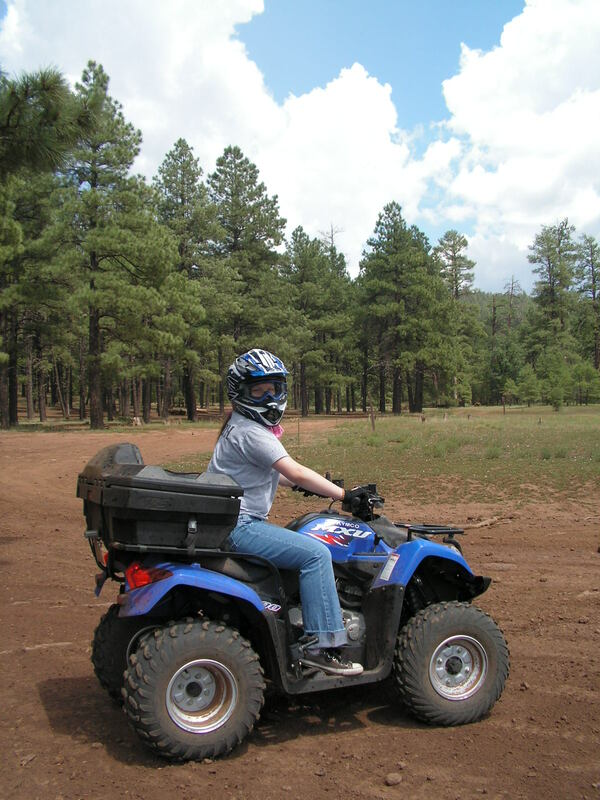 My daughter is 16 and drives, so the excitement of speed is not really doing it for her on a quad. But my boys are 13 and 11 and I think this was the most fun they’ve had …… (thinking)…. EVER. Their first motorized experience. WOW! Larisa flying through the air with the greatest of ease. 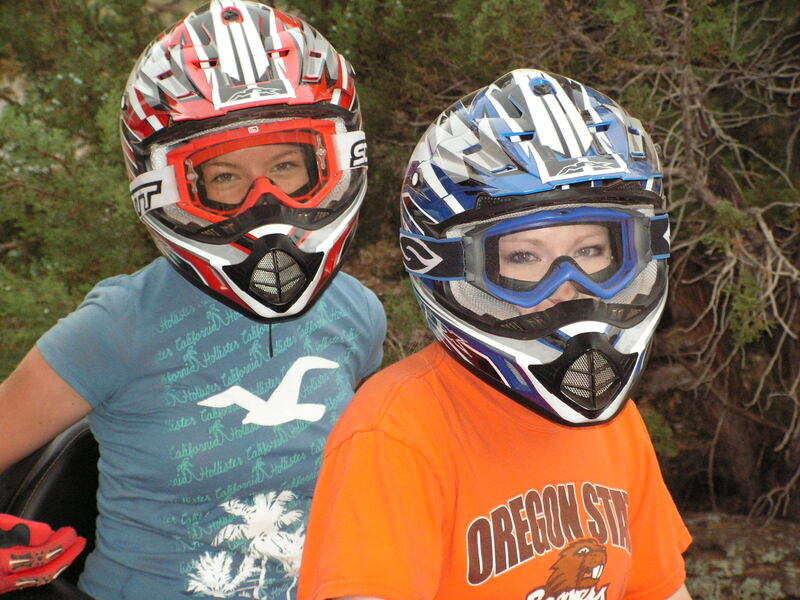 Even though my daughter and I rode the four-wheelers, it’s not really our cup of tea. I’m down with speed and the thrill of a bumpy uphill trail…. but the dust and grime I could certainly do without. Every article of clothing from each person from each quad trip had to be washed immediately. I wouldn’t even let the kids sit on the wooden kitchen chairs in filthy clothing! The cloud of dust following each child reminded me of PigPen from Peanuts. See how much fun you can have accessorizing a quad? Helmet, gloves, bandana, clothing. It really does meet some feminine needs. The county road out to our meadow with trails requires a “street legal” driver… so I was sequestered into getting dirty two different times. I’m the good mom. I complied. 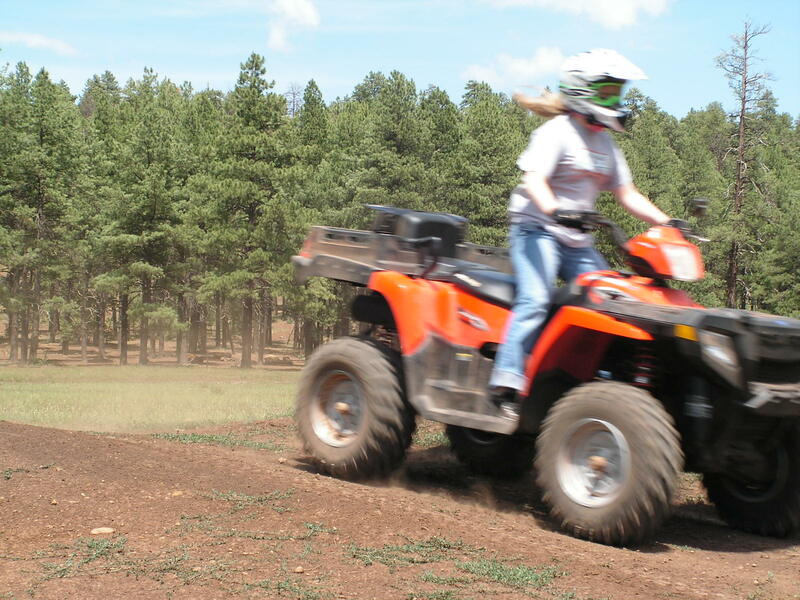 But after riding with their “living-on-a-prayer” father, the boys didn’t sincerely relish riding on the quad with me. What’s up with that?!? We have been Emergency Room free for over 18 months now! That is a record for our family and I plan to keep it that way. Both boys have decided that they are now saving their “car” money for a quad. Whatever. They looked up used quads on Craigslist and eBay withing minutes of being home from vacation. This will take a LOT of lemonade stands, I’m telling ya’ what! Our trip to Bountiful has proved to be much more of an adventure than I was prepared for. For ten days we are relishing in the somewhat cool mountain air twenty miles south of Flagstaff at Munds Park in Northern Arizona. Yes, it’s still been 90 degrees but that is a welcome luxury compared to the 115’s of Phoenix. Can’t say that I’m missing home right now. At all. I thought for a moment… and it’s true. Not at all. Reading, sewing, relaxing, game playing and napping were all high on my list for this trip. I did manage to accomplish the finishing touches of one Bag for Zaza while here, and I’ve started the hand-embellished fancies for a cute little girl’s denim purse. One book down, two to go. Game playing has picked up with the arrival of the game-obsessed family members. :o) Naps have been plentiful as well. What I didn’t account for was the toll on my poor body. Ice cream sandwiches were calling our names from the country store, so we ventured off for the 1.5 mile walk down the hill….. knowing the ice cream sandwiches would be a necessary fuel for the crawl back up the hill. Only ten or twelve houses down the sidewalk-less street, I noticed my 11-year-old son skid on some gravel. One house later there was a cement driveway covered in small black stones and I told the kids, “This is the kind of rocks that slip easily on pavement…..” and then I proceeded to demonstrate just how easy it was to slide on the small stones. My left leg slid down the hill and I gracefully, in slow motion, went down as my right knee kissed the gravel. Blood followed. Ouch! And drat it all, I ripped a hole in my favorite black Capri pants! We turned around and hiked back to the cabin to find the well equipped first aid box. Ouch! Ice cream sandwiches were calling more loudly at that point… so we drove down. This cabin comes fully stocked with two quads for offroading adrenaline rushes. Helmets, goggles, gloves, etc. etc. etc. My husband and I took our eldest and youngest out for a tromp through the pine trees. We took turns riding and driving and bumping along the not-so-smooth paths. I knew I would be sore the next day simply from holding on! One particular tromp, my 16-year-old daughter was driving and I was on the back, holding on for dear life. Now I understand the phrase “holding on for dear life.” Anyway, we somehow got off the trail and were making our way through virgin forest when she spontaneously ducked to avoid being stabbed by tree branches…. and I did not. Just below my right collar-bone a branch stabbed me and I screamed out. No blood followed, but I do have a highly tender spot, a quality bruise with some good scratch marks. Ouch! Quadding is the dirtiest sport I’ve participated in throughout my entire life, I’m quite certain.